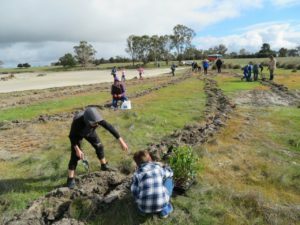 As part of the Gondwana Wetlands program, Green Skills and the local Gillamii Centre organised a lake foreshore re-vegetation and wetland restoration project on the Lehmann farm, near Cranbrook on Thursday 26th July 2018. 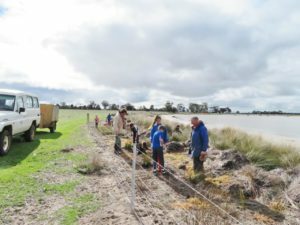 Forty two enthusiastic students and four teachers from the Cranbrook School helped plant 2400 salt tolerant shrubs and trees (of 12 species) around the riparian zone of the newly fenced lake on the property. 9 constructed bird habitat islands were also planted to local rushes. Also on hand to help with the planting were three generations of the Lehmann family, Gillamii project officer Jenni Loveland, along with three Green Skills volunteers working with Basil Schur, Denmark based project manager. The plants were grown by Albany Farm Tree Nursery. Technical advice for revegetating the site was provide biodiversity consultant Wendy Bradshaw, from Tambellup. Fulcher Earth moving of Mt Barker constructed the islands back in March when the lake was dry. 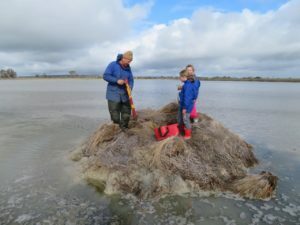 Sam, Sandy and Ian Lehmann supported the project by putting up the fence to keep sheep out of the foreshore area, and carrying out the site preparation. Funding for the project came through the WA State NRM program, as well as through Gillamii’s National Landcare Program supported project. All in all, a rewarding day.. building support for lake conservation across the Cranbrook community. 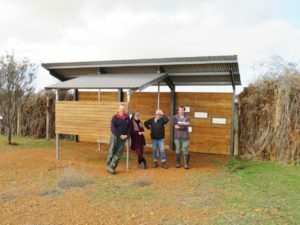 On the day some work was also done at the nearby Bob’s Lake Bird Hide site- Green Skills volunteers Adrian, Elliot and Indu, with landowner Sandy Lehmann.